Dr Kevin Nott and Dr Andreas Bergner outline the potential of a benchtop nuclear magnetic resonance instrument for structural characterisation in the chemistry laboratory. Nuclear magnetic resonance (NMR) Spectroscopy, along with mass spectrometry, is an important technique for structural characterisation thus has become a standard tool for organic chemistry. Unfortunately, time on an NMR instrument is expensive, even for routine analysis, because of the associated running costs. The super-conducting magnet requires regular cryogen fills of liquid helium and nitrogen, the former becoming an increasingly scarce and therefore expensive commodity. In addition, it normally requires an expert to run and maintain the instrument. In contrast, benchtop NMR instruments based on permanent magnet technology have low running costs as they are cryogen-free; these instruments are commonly used for measurement of oil, moisture, solid fat and fluorine content for process and quality control. Permanent magnets constructed from rare earth metals have been developed recently which are smaller, lighter and have much better performance than traditional AlNiCo magnets. For example, the MQC benchtop NMR analyser has the smallest magnet footprint as well as the largest sample capacity, 14ml, for a magnet of it class (magnetic field >0.5 Tesla, 20MHz in frequency). This results in increased signal-to-noise and better sampling leading to improved accuracy. In addition, the combination of larger sample size and innovative accessories leads to easier sample preparation for many applications, including measurement of oil content in snack food, spin finish on fibre and soluble fluoride in toothpaste. The MQC uses the time domain signal to distinguish between solid and liquid, or oil/fat and bound water by their different decay time constants. Thus the bulk NMR signal from an oil, for example in snack food, may be determined immediately after signals from the both the solids and bound water have decayed; this signal, normalised by mass, may be used to calibrate for oil content. More recently, a bench-top NMR instrument has been developed that is capable of acquiring high resolution spectra in the frequency domain. Pulsar differs from the MQC in that (1) the magnet has better field homogeneity which leads to sharper, well resolved peaks, and (2) the field strength is higher, 1.45 Tesla (vs. 0.55 Tesla) required for better spectral resolution, or separation between the peaks. The Pulsar gives spectral information by applying a Fourier transform to the Free Induction Decay (FID). 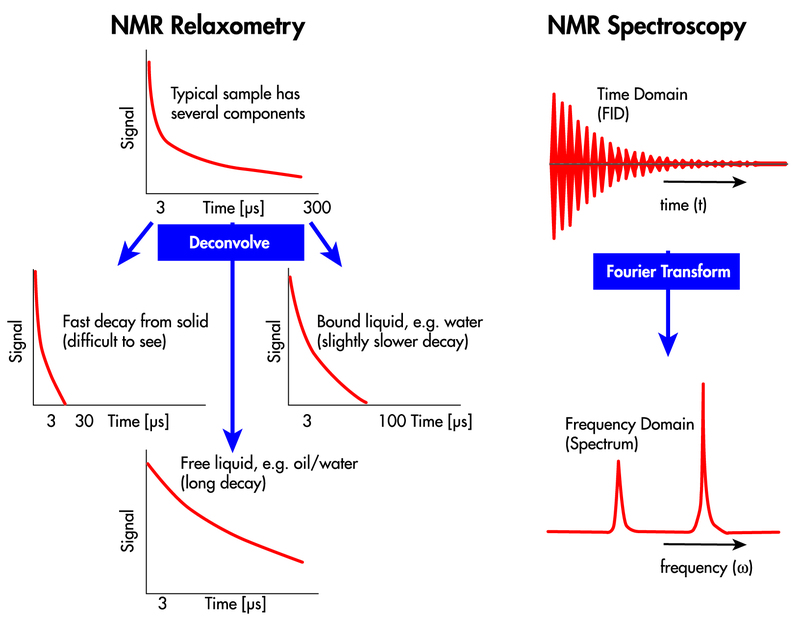 A schematic representation of NMR Relaxometry (or Time Domain NMR) and spectroscopy is given in Fig. 1. Fig. 2. shows the type of information that can be obtained from bulk vegetable oils using the Pulsar spectrometer. 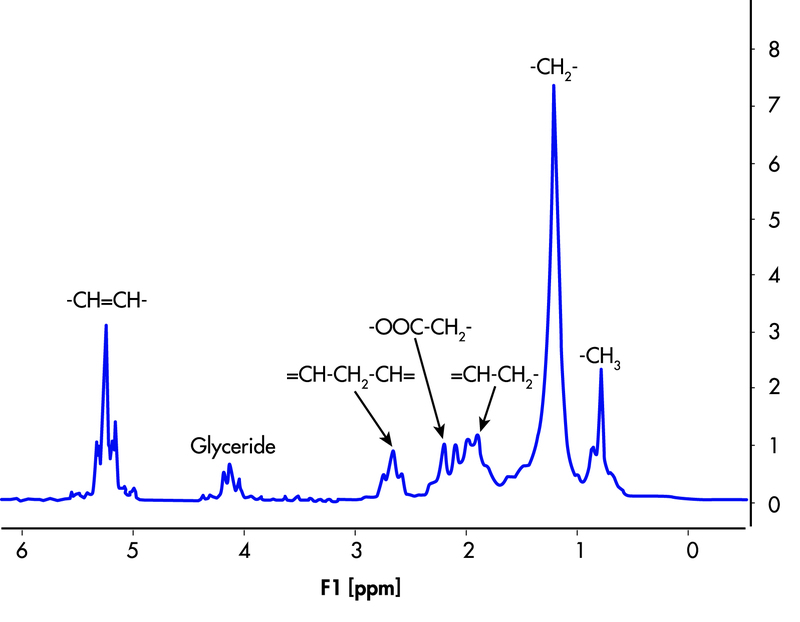 The 1H NMR Spectrum of glyceryl trilinoleate shows all the resonance peaks associated with the functional groups of a triglyceride. Using this information it is possible to measure the level of unsaturation, both mono- and poly-unsaturates, in the triglycerides1 as well as use the spectrum as a characteristic fingerprint to classify the oil2. In the same way the MQC excels at quality control, Pulsar has the potential to be a valuable tool for structural characterisation in the chemistry laboratory as well as being accessible and affordable to all.